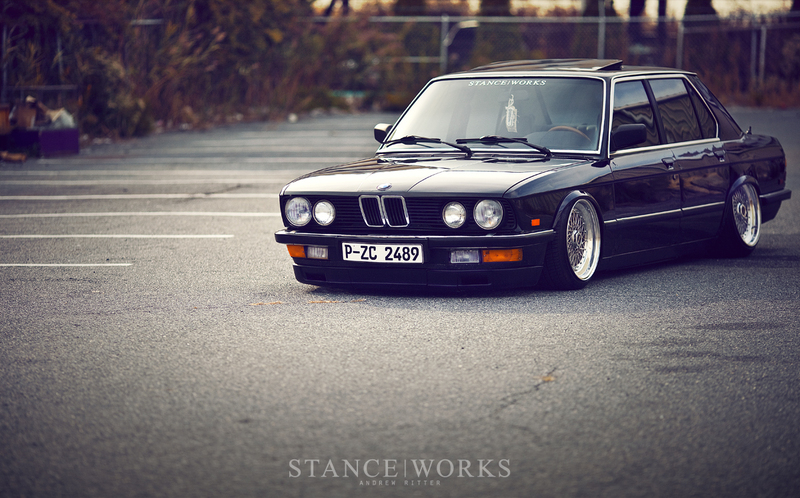 Jeremy Whittle's BMW E28 is no stranger to the StanceWorks homepage; most recently, a writeup on his Air Lift suspension install gave insight to those wondering exactly how to get their vintage BMWs closer to the ground. 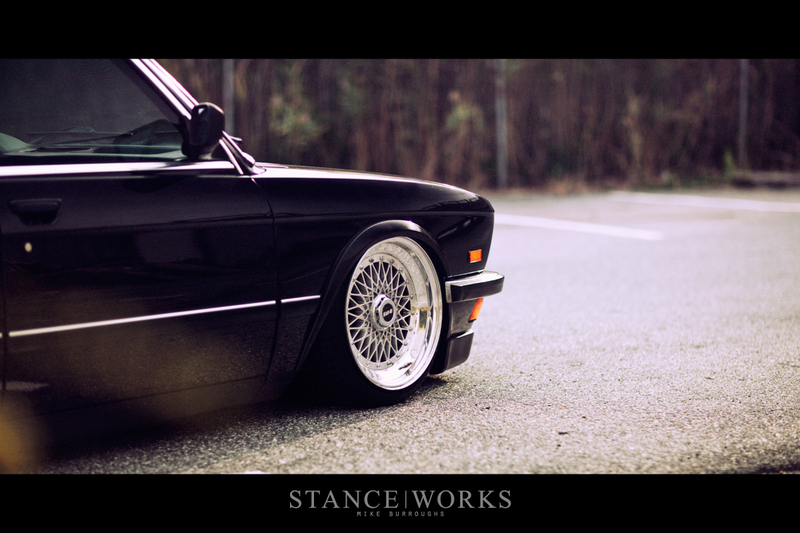 Prior to that, we've looked at the hard work Jeremy has poured into transforming his E28 into something entirely unique. In all, Jeremy's car has come a long way over the past few years, from bone-stock to one of the most notable E28s in the BMW scene today. We find ourselves admiring Jeremy's car once again - the latest tricks up his sleeve have moved his car into an upper tier - and we're proud to call it one of StanceWorks's own. 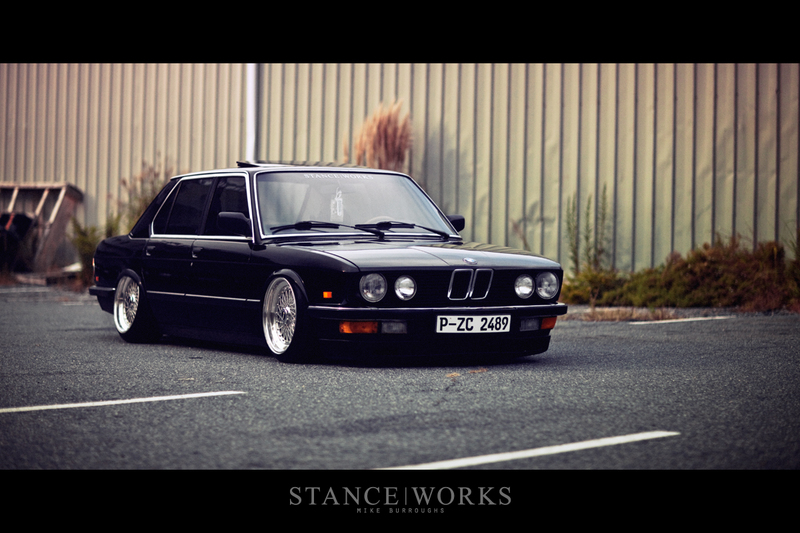 Throughout the growth of StanceWorks, Jeremy has played a crucial role in helping shape us into what we are today. He's been there since day one, having solidified in our hearts exactly what StanceWorks is all about: the people you meet and the things you create with them. I've found myself wrenching on Jeremy's car on more occasions than I'm able to recall; from hot summer afternoons in gravel driveways to freezing winter nights on cold garage floors. I've seen his car go from run-of-the-mill to something truly special. Most importantly, I've watched Jeremy see his vision through, sticking with a car for years on end to achieve his dreams. It's all too common today to see fellow enthusiasts burning through cars like a "pack-a-day" smoker. Every few months, for some, it's a new car with new wheels and new suspension. While it's not always the case, I may go so far as to say that if the car fails to net attention for these owners, it's on to the next one. It's growing increasingly rare to see owners hold on to their cars and see their builds through, but Jeremy hasn't let go of his vision. As mentioned in his first StanceWorks article, Jeremy sold his rather new Z4 in order to put himself behind the wheel of something with a bit more history. Ever since, despite the radical modifications and numerous nights out of commission, it has been his only car. Since the last time we took a close look at Jeremy's build, his suspension has been swapped out for a custom Air Lift setup, fabricated using their unbelievably easy-to-use Crafter Package. After a weekend of running lines, installing tanks, and building the suspension, Jeremy's car has been more roadworthy than ever. The family sedan can now carry more than a single skinny passenger: our friends and family can now enjoy the car to and from nights out on the town. The worry of speedbumps has gone right out the window, and the comfort that BMW is known for is finally back. And of course, the car looks better than ever. The latest addition to the car is single turbo conversion. The swap was prompted after his factory CT12a twin turbos failed just 3 weeks before his 1500-mile road trip to Ocean City, MD for H2Oi this past September. Jeremy swapped his turbos out for a "good" pair of replacements, but unsurprisingly, the second pair failed as well en route to Maryland. Taking it as a sign from the Toyota gods, Jeremy decided to bite the bullet and swap to a single aftermarket turbocharger, a dream he's had since swapping in the 1JZ two years ago. After talking to Aaron at DriftMotion about what kit would best suit his car, Jeremy opted for the new 62-62 billet kit, giving the 2.5l 1JZ an entirely new breath of life. After a very smooth install, the E28 is back on the streets and on daily duty. Inside the car, Jeremy has made some minor changes. He's swapped out his old, torn seats for cleaner E30 counterparts in the original Taurenrot color. 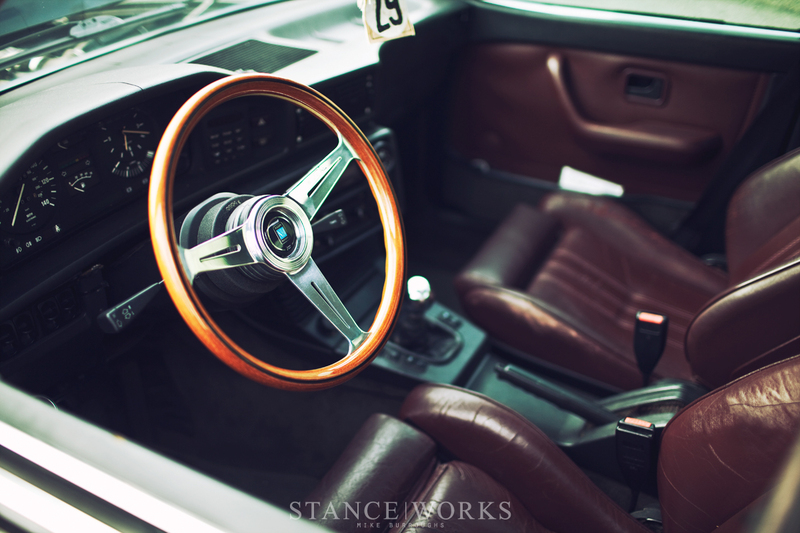 He's fitted a woodgrain Nardi wheel to accentuate the interior while keeping a very OEM feel throughout. After all, with the car in a raised position, its aesthetic is reserved and classic, the vintage HRE wheels providing an era-correct look to an otherwise understated car. With much of the build finally coming together, and few bolts left unturned, Jeremy plans on simply enjoying the car, or as he affectionately refers to it, "driving the piss out of it." Part of me wonders where we'll go from here? Where will I be able to lend a hand next? While the project is never-ending, the steps become fewer and further between. A sense of accomplishment comes from knowing the car is growing closer and closer to the idea that lies somewhere in Jeremy's head, but a sense of disappointment arises in knowing that the remaining number of times I will find myself lying under the car cursing in frustration grows smaller. Jeremy's car, and for that matter, the cars our friends own, represent more than their outcome; more than their final form. It's these machines that have brought us together time and time again. From the joys of success to the frustrations of failures, they've been an integral part in forming some of the best friendships imaginable. As much as we can say "it's not about the cars," there's no point in short-changing them. 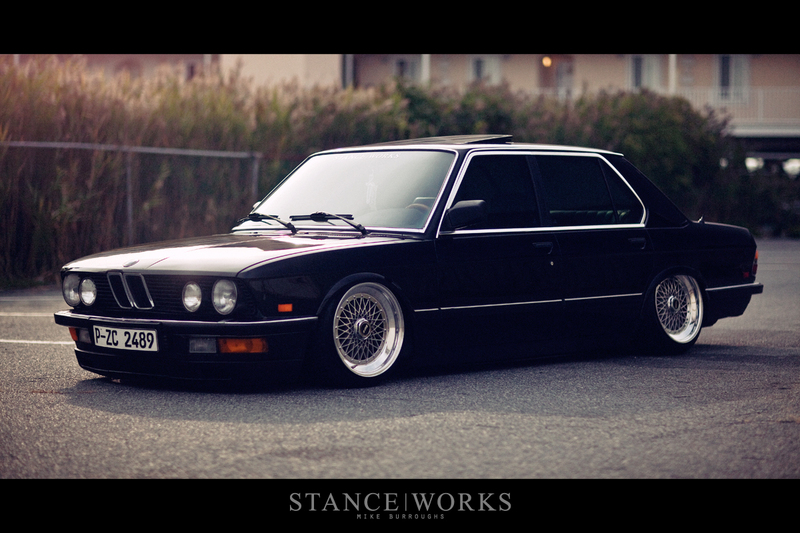 If and when this E28's day comes, I know that, for better or worse, Jeremy will be on to the next one as well. I can only hope that once again, I'll be there as well, misplacing tools and rounding off bolt heads: that's what it's all about. 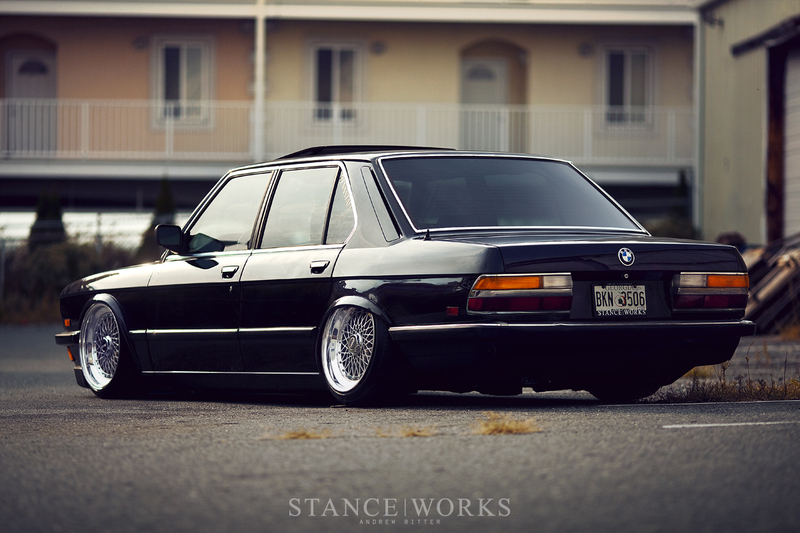 This is by far the SICKEST old-school bmw i’ve ever seen. I can only imagine how nice it would be in person. guys, you – super! to make such a car – it’s a work of art! 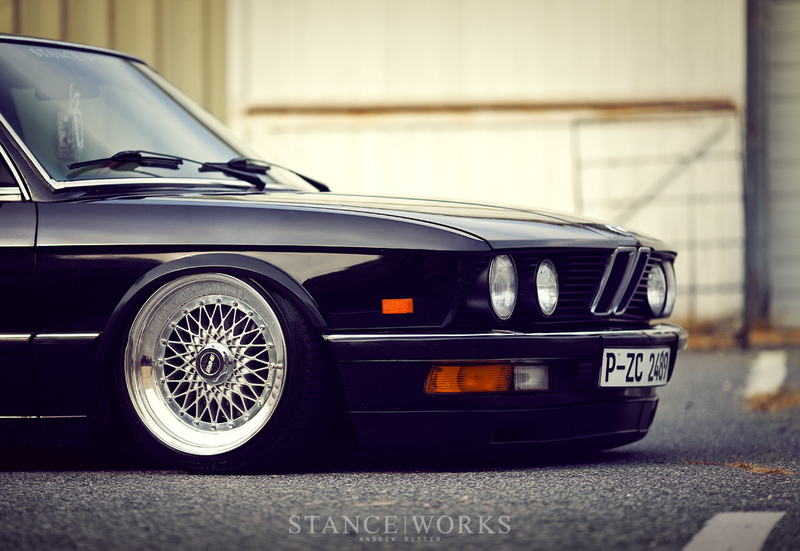 I’m from Russia, I go to the e28. Constantly monitor your work, and my delight, there is no limit. I write this post using Google translator.